Bengaluru is one of the most loved places to live in the country and the way this city has embraced the cultures of the different arena is truly phenomenal. With the fame of being called as the ‘Garden City of India’, Bengaluru houses most number of Parks and Gardens thus glorifying the beauty of lush green around. Yes, compared to old Bangalore, a number of green spaces are diminishing but still the city is nourishing few of the cenotaphs which are known for their historic influence. One such place of this significance is the famous Bugle Rock Garden located in the Southern part of Bengaluru. Bugle Rock (Kahale Bande in Kannada) is an elephantine rock in the Basavanagudi area of South Bengaluru, famously known as ‘Rock Garden of the city.’ It is said that it is an abrupt rise above the ground of Peninsular gneiss as the main rock formation with an assessed age of about 3000 million years. While exploring the history of Bugle Rock, we have found some interesting things about it. Come, let me apprise the story of Bugle Rock in today’s read. Kempegowda II, the feudal ruler of Bengaluru takes stock in building four watch towers setting limits for Bangalore’s expansion and one among them is on the Bugle Rock. It is said that a sentry would blow the bugle and hold a torch (panju in Kannada) which was visible from other three watch towers; one on the Kempa Bundi tank on the west, the second near Ulsoor lake in the east and the third tower in today’s Mekhi circle in the north. The intention of blowing bugle was to inform people that everything was safe at the location and also to warn the intruders into the city. If you observe the rocks in the location, you will find hollows, which were once used to light lamps. The vantage point is spread over an area of 16 acres and the rocks here are similar to that of rocks at Lalbagh tower. Bugle rock is not just the mere rock formations. It is bestowed with a beautiful park, water falls, and fountains. It is one of the frequently visited places by locales, nearly 750 to 1000 per day and thus credited with a name “walkers paradise.” This is counted one among the 26 National Geographical monuments in India which lie in the archaean stratigraphic division of the Indian shield. Bulge rock garden is tree-lined park filled with lush green around. There is an amphitheater developed in the precincts of the park, which can accommodate 300 people. The park houses two famous temples; The Dodda Basavanna Gudi (Bull Temple), and Ganesha Temple which are known and appreciated for their historic significance. It is said that during Third Mysore War, Mysore army assembled in this rock area under the leadership of Mir Kahmmar – ud-din before attacking the British army. The park is named in the honor of T.R Shaamanna, a humanitarian and local politician. Bugle Rock Garden is one of the beautiful spots we have in the city and the combination of Rocks and Greenery makes this place magical and beautiful. In the premises of Garden, you will find an old water tank and its outer wall has murals of famous personalities of Bengaluru and Karnataka; Kempe Gowda, Bharatha Ratna Sir Mokshagundam Visweshwaraiah and the Kannada littérateur D V Gundappa. Bugle Rock was the famous meeting point during the time of Old Bangalore. It was a place where D V Gundappa used to meet Masti Venkatesh Iyengar (Gyana Peetha Awardee), A N Subbarao (founder of Kalamandira), and other noted people. Today, you see rock pillars, beautiful landscapes, rocky steps, and the sculptures in the Garden. If you go up the Rock then you can enjoy the magnificent view of Bengaluru city. It is said that at one time, Utility tower, MG Road, and Ulsoor Lake were easily visible from the heights of this Bugle Rock. This was the story of Bugle Rock of Bangalore. We’ll come with more stories about Namma Bengaluru. 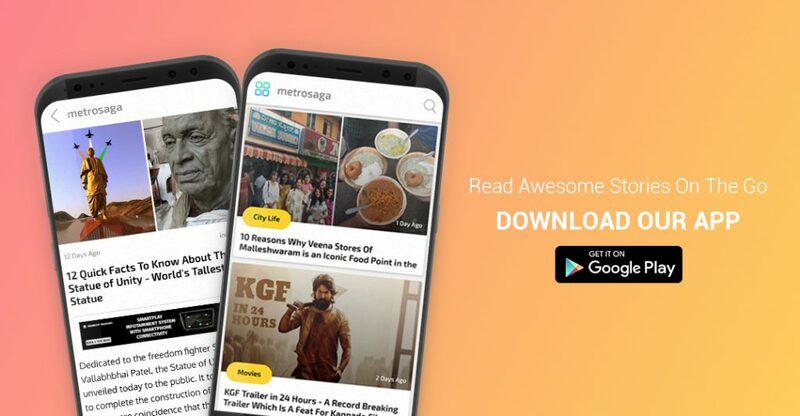 If you don’t want to miss them then Subscribe to Metrosaga and stay tuned. Next articleDo you have a Dare to play this iPhone version of Blue Whale Game?